1) My family is the most important thing in my life. 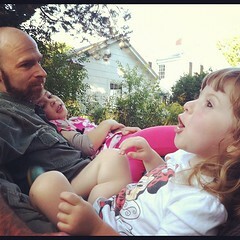 I have been married to my husband Dave for 10 years this October, and we have two little girls. Ingrid will be 7 in May and Willa will be 3 in April. I love them the most. 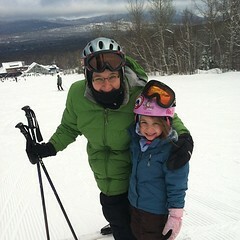 My parents live in Maine, too, splitting their time between the house I grew up in in Grand Lake Stream, and spending winters now at Sugarloaf. I have one sister that lives in Golden, CO, and she is getting married this summer, when I will add a brother in law and nephew (his son) to my family. 3) I am really passionate about making sure that girls and women are given lots of opportunities in life, and not marginalized. An organization I support is Hardy Girls, Healthy Women. The 5k photo here is from a race I have now done twice. 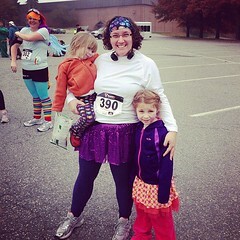 I was the biggest fundraiser for this event in 2012, and told my donors if I raised $250, I would wear a sparkly skirt (I am not much of a sparkly-skirt-wearing person) in the race. Now, that is my “official race skirt” and I have worn it in other events, too! 4) I love to read. Lately I have been on a nonfiction kick – I just finished Unbroken by Laura Hillenbrand, and am reading Mountains Beyond Mountains by Tracy Kidder. I have started using GoodReads to track my reading, and get recommendations from others. I got a new Kindle Paperwhite for Christmas, and Dave thought it was ridiculous that I’d want Yet Another Device, but I love my kindle for being JUST an e-reader. When I read on my iPad or iPhone, I am constantly interrupted by email notifications, tweets, game updates, etc. On the Paperwhite, I can just disappear into a book. I also love using Maine InfoNet’s Download library to borrow Kindle books for free. I also love listening to podcasts, usually when I am at the gym or running. My favorite podcast is This American Life, and the Moth Podcast is a close second. 5) I love to travel, even though it’s slowed down now that I have little kids. In my twenties, I drove cross country 3 different times, and spent a month in Australia backpacking on my own. In November, I took Ingrid with me to a conference in Denver, where my sister lives, and traveling with a bigger little kid was great. It made me look forward to taking my children on adventures as they get older. 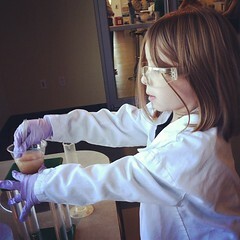 We visited with Kate and also spent time learning at the zoo, science museum, and other venues. Ingrid also had saved her money for months to buy an American Girl Doll, which was one of the highlights of her trip. were you driving a Blue 4 Door Chevy Car with State, “University” plates with two wreaths in the rear seat? Do you now have a large plastic tub with cups containing scallop guts intended for a research project at the University of Maine? So… this killed me. I posted on my friend’s share, and then shared it myself with the note “You wish you lived in Maine.” I said that it had all the elements of the perfect Maine story — shellfish, evergreen wreaths, the UMaine system, science, and two unattended and unlocked cars. 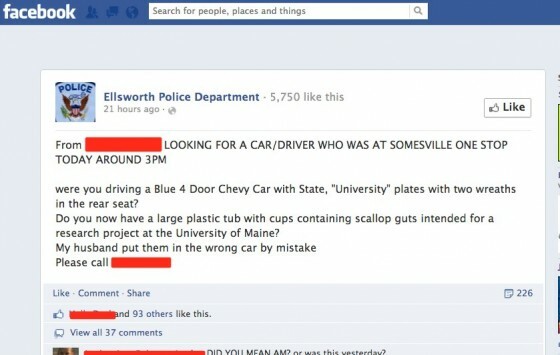 It got shared by others, and a reporter for the area wrote it up in the BDN:” Southwest Harbor man seeking scallop guts after putting them in the wrong car.” (Which is where I learned it wasn’t two cars nearby, but just a mixup, but still.) Another friend noted that the 7 digit phone number added to the perfect Maine-ness, which, I had totally missed the first time. Not to mention putting your home phone number on the PD’s Facebook wall! Mainers. We are trusting folks. And there you have it. Social media solved the case of the missing mollusks. I had forgotten the key element of the perfect Maine story before — “you are one degree from the subject.” And now, there is no more awesome Maine story I could be a part of. Edited a second time to add the blog post of the grad student whose scallop gonads were lost. I love the internet. Found: My lost ‘nads. Edited for a third time to add the link to the Colbert Report! On Friday, Ingrid and I are flying to Denver, to stay with my sister and for me to attend Educause, the big national conference for my field. The conference isn’t til 11/7, but we are going to be gone 11/2-11/10 so that we can get in some great Aunt Kate time, and see the sights. When I booked our flights, I opted for the earliest flight from Bangor with the quickest connection — if we make the connection (40 minutes in LaGuardia), we will be in Denver before 11 am MT. For the last few weeks I’ve been stressing about that connection, looking at historical gate assignments via flightstats.com, to see if they are in the same terminal (yes, usually, for the Friday pairing) but now that Sandy has hit, my concerns are all new. This blog post from Jetblue is making me sweat, a little. I have some friends with friends in high places that think we’ll PROBABLY be okay for Friday, and the Delta update today seems to assure that, but still. That is a LOT of water. A LOT. And the friend of a friend connection said that the damage at LGA might actually be worse than expected so to just pay close attention to my airline’s updates. With that, I used Twitter to reach out to DeltaAssist to see if it would help (all involved) if I switched to the flight that connects through Detroit and gets in later. (Especially now that Kate has to work on Friday, that pre-11am arrival is sort of moot). But, since it’s not in the dates specified for free changes, they can’t do it. Which is kind of dumb — I’m just passing through, and I’d think there are people that NEED seats into and out of LGA more than I need to just pass through, but, ooohhhkay. I’ll just keep checking Delta’s alert page and try to get in touch if things start to look bad for Friday. But even if we don’t get there on Friday, I had the epiphany today that the worst-case scenario is that we shift our travel dates. We aren’t rushing to meet a boat for a cruise, we won’t lose expensive nights at a resort, the worst-worst case is that we show up too late to go to a magic show Kate got us tickets for on Saturday night. I can adjust my dates because I am in a career and position where that would be fine, Ingrid’s already going to be out of school for a week anyway (and if we had to move it forward a day or two, she’d actually miss LESS school) and Kate’s life as a full time student means that we will still have tons of time with her and she’s not going to have to burn vacation days or something. My conference runs from 11/7-11/9, so I’d frontloaded our trip for the fun part, if it ends up that there is fun on either end — oh well. So, whatever happens, happens, and it will be great to have this time with my daughter and my sister. Even if it’s not on the most exact schedule I’d planned months ago. We were married by a notary that I had worked with for years at Borders. Spiders featured prominently in our decorations, and our cake topper was Gonzo and Camilla. Our families and closest friends were there, but you know who wasn’t? God. We are not Christians, we identify as agnostic, really, and just try to live a good life in this world and hey, if the Christians are right, then maybe we will CLEP out of whatever they think it is one should do to reach heaven, and if they aren’t right, well GUESS WHAT. We did good while we were here. Ashes to ashes. So when people hold up my marriage as some holy union simply because Dave is a man and I am a woman, well, HOLD UP. We got married because there are some serious perks to that. Know what the very first thing I did, once we got married, was? Not change my name (I kept it, and we’ve passed it on to the girls, too) but schedule a DENTIST APPOINTMENT. I hadn’t had one in years because I’d been a full time college student, or retail worker, and yeah, it just wasn’t an option. Once we were married, though, I signed on to Dave’s health plan in a hot minute and started scheduling all the appointments I’d never afforded as a student. The next thing we did was save up money to buy a house (this very one I’m sitting in now!) and that happened about 6 months after our wedding. And then when we decided to have children, we just did, and there was no worry about Dave’s rights or who would make decisions in the event of some unthinkable complication with me — he was my husband! Of course it would be him. And nine years later, here we are. Two beautiful daughters, a cozy home, a minivan, health insurance and joint checking accounts and term life insurance with each other as beneficiaries and all. And the only church we’ve been in in those nine years was for my cousin’s funeral. And you know what? I don’t care if God is IN your marriage! That’s awesome! Three way! Knock yourselves out! But don’t force him into mine, or hold mine up as being more legit “because God said so.” Because your God and my marriage have NOTHING to do with each other. And when I go back to our agnostic principles — folks, love one another. I really do not want to be around people who were cruel on earth, even if I get AP credit for my good deeds while I’m here. Voting Yes on 1 will provide equality for people like, oh, say my best friend Andy, known to the girls as “Uncle Andy,” who has been my friend since we were 6 years old (Ingrid’s age! which blows my mind) or for people like Bev and Sue, whose youngest girls go to daycare with Willa, and their oldest was at Ingrid’s summer camp, and Bev ran the Freaky5k with me last year. (I’d be willing to bet she’s not doing it this year because she is working on campaigning for this issue. Just a hunch.) Or for Suzanne and Sandi, friends of friends (although Suzanne’s blog was the inspiration for me to try running in the early morning and to make this pie (and I did both the same week so they probably cancelled each other out)). Or maybe for my old friend Shawn, who is an out and proud police officer in Aroostook County. For my mentor Marilyn, for Erin & Heidi, for my friend Pam, for my friend Josh. (And here is where I worry I left someone out, but I want it for you too.) For my own daughters — so that they may grow up in a world where equality is a given, is a right, is not something we are freaking VOTING ON. But we are. Vote Yes. Be on the right side of history. So, I drafted this almost 2 weeks ago, and I figured I’d post it for my anniversary, but then I went to pick up Willa’s birth certificate and saw that early voting is happening in Bangor, already, and I decided I needed to post now. Also, while we are generally anti-political signs in our yard because we figure people know who they are going to vote for, and signs just piss off people you might otherwise like — we are getting a sign. This is for a basic human right, not a whole platform of issues (and honestly, we are independents so there’s no complete platform we totally agree with, in general) and Suzanne’s post about yard signs struck me. I wasn’t going to get one anyway, because we are on a tiny street that gets no traffic, and again, we probably won’t change any minds. But if it marks us as a house where people can feel “safe and protected,” as Suzanne wrote, then dammit, I’m putting up a sign. If you don’t quite get the title, here’s a clip. When the ‘choose birth year’ defaults to the current year, or to 1912. At least make it in the ballpark of legal, and still living, adults. When you click the ‘country’ drop down, and United States is buried in the U’s. When you click the ‘country’ drop down, and United States is at the top of an otherwise alphabetical list. Yes, both ways make me crazy. When the form requests a ZIP code and then the City and State. That’s why ZIP codes exist! Cross-reference! That four other municipalities use my ZIP code. If you have your own school, you should have your own ZIP. That Google doesn’t use ReCaptcha. Willa can pump! from gretchen on Vimeo. Not yet 2.5 and pumping like a big kid. 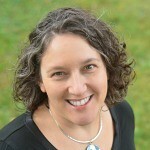 I have been blogging in one form or another since 2001, when I started at Diaryland. I moved from Diaryland to LiveJournal to Typepad, to another Typepad, to vox, to WordPress, to Posterous, to Tumblr and all the way through, my blogging identity got more and more fractured — I should have just a blog for my family, and then one for my friends, and I don’t want to bug either with my tales of running, so I’ll start a new one… and pretty soon I had a lot of little blogs and it was too much to keep up with so I just stopped. So, I slurped up my most recent posterous blogs (the family one, and the running one) and pulled them into my hosted account (where I had grand plans of just a ‘professional’ blog) and here is where I am going to write about my life, which involves my family, my career, my pursuit of a better me. And I’m just going to get better at using tags so that the people who roll their eyes at kids can skip over those posts and go right to the ones about tech, or the family members can say “LMS, iOs, WTFs, where’s the cute pics?” and click on family, and the people who need to know that non-athletes can run, too, can click on fitness, etc. Celebrating @davegordonvideo bday and @lschaefer61 and dads 40th anniv with some local goods.